One of the best things about PHP is that it is a great language to just 'dive into'. Thanks to its wide-ranging popularity, anyone with the ability to hit "Search" on Google can quickly create a program. However, this also lends to a major criticism of PHP, i.e. it is almost too easy to find and reproduce bad code. 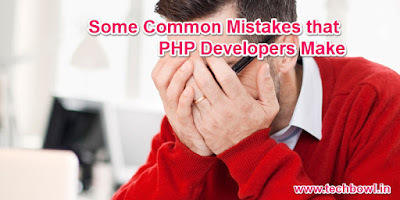 Here are some mistakes that any PHP programmer, regardless of skill level, might make at any given time. Some of the mistakes are very basic, but unfortunately, they can trip up even the best PHP programmer! Other mistakes are hard to spot (even with strict error reporting). However, all these mistakes have one thing in common: They are easy to avoid.! It's easy to just use double quotes when concatenating strings because it parses everything neatly without having to deal with escaping characters and using dot values. However, using single quotes has considerable performance gains, as it requires less processing. $foo outputs to "hello $boo" and $bar gives us "hello everyone". That's one less step that PHP has to process. It's a small change that can make significant gains in the performance of the code. If you use a database in your PHP application, it is strongly advised that you at least use some sort of database caching. Memcached has emerged as the most poplar caching system, with mammoth sites like Facebook endorsing the software. Memcached is free and can provide very significant gains to your software. If your PHP is going into production, it is strongly advised to use the caching system. Error reporting is a very handy feature in PHP, and if you're not already using it, you should really turn it on. Error reporting takes much of the guesswork out of debugging code, and speeds up your overall development time. Many times PHP programmers are too trusting with data, especially data generated by user. It's imperative to sanitize data before it goes into any sort of storage, like a database. While comparison operators are an extremely basic part PHP programming, mixing these up in your code is certain to bork your program. As the German proverb states, the devil is in the details! Being familiar with the often-misused operators like =, ==, != , are absolutely critical to PHP programming. Taking the time to really understand the differences will greatly speed up your programming and yield less bugs to debug. Don’t get me wrong, mysqli is (quite literally) generations ahead of the ancient mysql extension. It’s kept up to date, secure, reliable and fast. However, it’s mysql specific. Using PDO instead would let you use some wonderfully practical object oriented syntax, and would prepare you for tango with other SQL databases like PostgreSQL, MS SQL, and more. What’s more, PDO will let you use named parameters, a feature so useful, few people can imagine going to anything else after having taken proper advantage of it. Last but not least, there’s this: you can inject fetched data directly into a new object, which is a delightful timesaver in large projects. Another commonly ignored and easy to fix issue. URLs like mypage.com/index.php?p=43&g=24 are just not acceptable in this day and age. Due to it being incredibly difficult to write a good URL rewriting guide that would cover every server and framework out there, almost every framework has a guide on how to set up clean URLs (Laravel, Phalcon, Symfony, Zend) and any that don’t just aren’t worth using – they obviously don’t care about modern practices. Never use * to return all columns in a table–it's lazy. You should only extract the data you need. Even if you require every field, your tables will inevitably change. It is tempting to add indexes to every column, however, they are regenerated during every table INSERT or UPDATE. That can hit performance; only add indexes when necessary.